The New Zealand courts have denied granting asylum to a Kiribati climate refugee, but that isn’t going to stop the problem. Deputy editor Sandi Keane reports. THIS WEEK, the High Court of New Zealand delivered a blow to a largely ignored asylum seeker problem that has been quietly bleeding and threatening to hemorrhage into a full-scale global catastrophe within two or three decades. A 37-year-old man from the tiny, obscure nation of Kiribati, Ioane Teitiota, stood to make history as the world’s first climate refugee. He argued that global warming is a form of persecution and that those displaced by its effects should be recognized under the UN’s Refugee Convention. However, in his judgment, Justice John Priestley said it was not the High Court’s place to alter the scope of the Refugee Convention by granting Mr Teitiota’s leave for appeal. Although he has lived in New Zealand since 2007, the government has refused Mr Teitiota and his family asylum based on the current convention which was drawn up more than 50 years ago, before rising seas started threatening the 33 low-lying equatorial islands and atolls that make up the tiny nation, just under 4,000 kilometres north-east of Brisbane. The situation is now so dire there is no room left to bury the dead on some of the islands, let alone provide a home for the living. They are being encouraged to leave by their President, Anote Tong, who described his policy of orderly evacuation at the UN General Assembly in September as“migration with dignity”. Fresh water – a basic human right – is the main problem. Bloomberg BusinessWeek reported last week that fresh water supplies would run out before the rising seas fully submerge Kiribati. Although aid agencies around the world have been warning governments for years about the coming tsunami of “climate refugees”, the world is unprepared for Mr Teitiota and his kind. According to Steve Trent, chief executive of the London-based Environment Justice Foundation(EJF), governments are in denial about the effects of rising seas despite sobering statistics. The EJF, an international non-profit environment and human rights organisation, has been lobbying governments and politicians for a new agreement on environmental refugees. The EJF told Independent Australia that climate refugees already outnumber those people fleeing persecution by three-to-one and predicts that the number of climate refugees could climb to 150 million by 2050. Bangladesh, one of the worst to be affected by rising seas, will be looking to house a population that already numbers 155 million. The Indian government has moved in anticipation of potential cross-border migration, erecting a 4,000 kilometre barbed-wire fence, patrolled by guards. Mr Trent says global policymakers can no longer ignore the plight of such vulnerable populations — estimated to be between 500 and 600 million people. The former Victorian state Labor Minister, Tom Roper, who is now a board member of the Washington-based Climate Institute, told Independent Australia that a number of organisations are pushing strongly for an amended treaty to include climate refugees. The EJF, on the other hand, believes a new legal instrument would be a more successful option as this would overcome political opposition to opening up the Geneva convention. Following EJF’s recent address to the European Parliament on a proposed alternative framework, Steve Trent reported that studies were now underway to scope out this issue. Of concern most to Australia, as a member of the Asia Pacific Forum, are its overcrowded near-neighbours Kiribati and Tuvalu. The Kiribati Government is hoping to buy 2,500 hectares on Vanua Levu from the Fijian government as a potential new home for some of its 100,000-plus residents. Tuvalu, whose capital Tarawa has more people per square kilometre than London, situated midway between Hawaii and Australia, has three times the population density of the United States. Coastal erosion has accelerated and its food and water supply is already under threat. 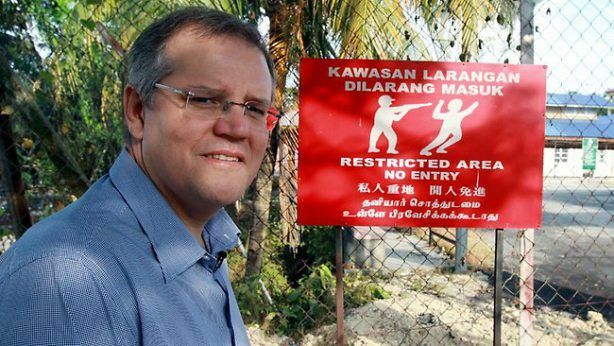 Immigration Minister Scott Morrison poses beside a sign that eloquently depicts his famous compassion for displaced people. But neither the Australian government nor Federal Opposition appear to have any plans to deal with the building crisis in the Pacific and neither Immigration Minister Scott Morrison nor opposition immigration spokesperson Richard Marles returned IA’s calls. In April this year, the Refugee Council of Australia advised the Gillard Government that it shouldcreate a new migration category for those fleeing the effects of climate change. Yet, only the Greens insist that Australia, as a major greenhouse gas emitter, should be prepared to play its part. The EJF and Climate Institute were keenly awaiting the New Zealand decision, hoping it would set a precedent. Mr Teitiota’s lawyer, Michael Kidd, told Independent Australia he will appeal the case all the way to the country’s Supreme Court. He expressed surprised that Mr Teitiota’s children had been completely ignored in his original claim for asylum. Inspired by a similarly novel argument used in Australia’s historical Mabo case, in which theInternational Convention on the Elimination of all forms of Racial Discrimination was a reference point in a decision that granted native title to Australian Aborigines, Mr Teitiota will appeal under UNConvention on the Rights of the Child. He will argue that sending three children, all under age six, back to Kiribati would subject them to dangerous conditions such as dwindling fresh water. “We have quite good grounds for appeal,” said lawyer Kidd. The EJF has been arguing for some time that climate change should be seen through a human rights lens. Steve Trent wants to encourage policy makers globally to accept responsibility for having created the very carbon emissions that now threaten those least likely to survive global warming. Published on Independent Australia 29 November 2013 here.